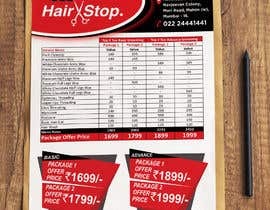 The Package Card is to be designed for our Unisex Salon "HairStop". Package card must include brand logo. Package Card Size A4. The salon is a budget salon. Our Brand colors are Red, White and Black and hence the design will need to play with these colors. All 4 packages need to be on one card to allow the customer choose better from available options. 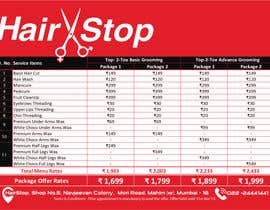 Address - HairStop, Shop No.5, Navjeevan Colony, Mori Road, Mahim (w), Mumbai - 16. Phone Number - 022 24441441. Terms & Conditions - Prior appointment is mandatory to avail the offer. Offer Valid until 31st Dec’19. All the prices given in the attached excel file are in INR (Indian Rupees). I am also open to seeing option where only service item descriptions are given with total package value and offer price is mentioned. I shall need Jpeg, AI and CDR files for the final selected design. The table in Excel which I have shared can be presented in a creative way as well. the headings given in my Excel file are also to be shown in a simplified manner. its men salon or women?